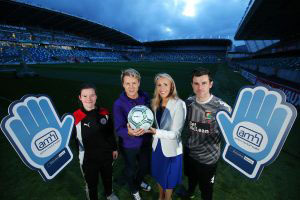 Cliftonville Women’s goalkeeper, Nikita O’Neill and Glentoran goalkeeper, Elliott Morris joined Callum Clark, Action Mental Health and Nicola McCleery, Danske Bank to launch a new charity initiative at the National Stadium at Windsor Park. Our charity partner Danske Bank will donate £10 for every clean sheet in the Danske Bank Premiership and Women’s Premiership in 2017. The announcement coincided with the Danske Bank Women’s Premiership season launch last week and should see teams in both the Danske Bank Premiership and Women’s Premiership determined to record as many clean sheets as possible in 2017.